The "Griechenkirche zur Heiligen Dreifaltigkeit" ("Greek Church of the Holy Trinity") is a Historicist church of the Greek Orthodox community in the city centre of Vienna. Ever since the counter-reformation, the Habsburg lands were thoroughly Catholic - at least on the surface. Churches of Protestants and Orthodox Christians as well as synagogues were prohibited until Emperor Joseph II released his "Toleranzpatent" in the late 18th century. Following this move, churches of non-Catholic denominations were founded all over Austria, the first ones usually in Vienna, the capital. These churches had to have plain facades; according to law, non-Catholic churches (and synagogues) were not to be recognised as religious buildings from the outside. You can see the result in the Stadttempel, the main synagogue of Vienna built by Josef Kornhäusel. From the outside, it looks like a residential building, there are no real windows that illuminate the main room. Only in the 19th century, these strict regulations were released; whilst the Stadttempel kept its secretive style, the Greek Orthodox church of the Griechenkirche was modernised and transformed into a "proper" church. The first modernisation was done in 1833. Later, between 1856 and 1858, he famous Ringstraße-architect Theophil Hansen designed a new historicist face and new interiors for the Griechenkirche - in the style of a Byzantine church. The Greek-Viennese banker Georg Simon Sina donated a large amount of money for the construction of the church. Since 1963, the Griechenkirche is home to the local Metropolite of Vienna, as well as a Greek school and a library. As common with Orthodox churches, the entrance area of the church is separated from the congregation space; the over-all impression of the Griechenkirche is dark. Note the "Cathedra", the chair of the metropolite. Right next to the Griechenkirche is the so-called "Griechenbeisl". The name is somewhat misleading, since "Beisl" is a Viennese slang term originating from Yiddish and referring to a small, usually cheap tavern or inn. The Griechenbeisl claims to be the oldest inn of Austria and tracks its history back to 1447 (which doesn′t really impress me, coming from Salzburg where the Peterskeller claims to date back to 803 - hah!). So "Griechenbeisl" sounds like a small, cheap Greek tavern. 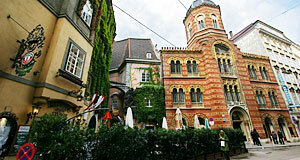 In fact, it is a high-end restaurant that was originally called "Zum Gelben Adler" ("Yellow Eagle Inn"). Only in the 17th century, when Greek tradesmen started to move into this area of the Fleischmarkt, the current name became common. Famous guests of the Griechenbeisl include Wolfgang Amadeus Mozart, Ludwig van Beethoven, Franz Schubert, Richard Wagner, Johann Strauss, Johannes Brahms, Mark Twain, Franz Grillparzer, Johann Nestroy and Ferdinand Graf von Zeppelin. Attractions nearby are numerous; to name only the most immediate ones: The Heiligenkreuzerhof and Bernardiskapelle; the Jesuite Church and Alte Aula; the Dominican Church; the Postsparkasse and Kriegsministerium; the Kammeroper or Chamber Opera; the Urania; and the Kornhäuselturm.